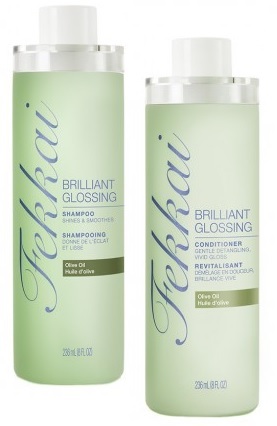 Oil enriched shampoos and conditioners from Fekkai, Matrix and Giovanni! Fekkai Brilliant Glossing Shampoo & Conditioner with Olive Oil - 236ml - $28 - infused with sun-ripened olive oil to soften, hydrate, eliminate frizz and add brilliant, lustrous radiance to dull hair.You'll also love the way fresh floral garden fragrance makes your hair smell! Available at Shoppers Drug Mart, Jean Coutu, Target and London Drugs. 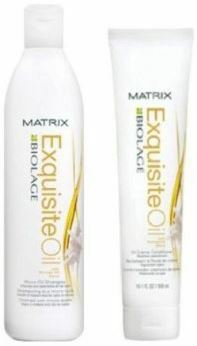 Matrix Biolage Exquisite Oil Micro-Oil Shampoo - 500ml - $16.95 - that cleanses as it nourishes with a light-weight micro-oil blend of moringa, macadamia, coconut and almond oils that replenishes the hair with oils and nutrients to leave hair silky and healthy looking. Exquisite Oil Creme Conditioner - 300ml - $18.95 - with a paraben-free formula of moringa, macadamia, orange peel oils and sage extract that detangles with weightless conditioning and helps restore shine for vibrant, illuminated hair, manageability and control . Available at participating salons - go to www.matrix.ca to find one near you. Giovanni 2Chic Brazilian Keratin & Argan Oil Ultra-Sleek Shampoo & Conditioner - 250ml - $9.99 - with a paraben free formula that contains Moroccan argan oil - a source of vitamin E and omega 3, 6, & 9 fatty acids with antioxidant power that helps combat damaging free radicals and Brazilian phyto-keratin - rich in amino acids and the nutrients vital to hair health to penetrate hair and deliver as well as retain moisture for hair that is soft, shiny and smooth to the touch. Available at Loblaws, Whole Foods and select specialty health food stores. Cute Alert - Sephora Wild Thing Kabuki Brush! Test Driving - Sally Hansen Miracle Gel! Summer beauty on a budget with Walmart! Cute alert - Foreo Luna Minis!